Ubuntu users of the 64-bit x86 architecture (aka, amd64) can expect updated kernels by the original January 9, 2018 coordinated release date, and sooner if possible. NOTE: I've been running the Linux 4.13 HWE Kernel in Peppermint 7 for awhile now, with zero problems. I'm on 4.14.12 kernel with KTPI patch on my Void box since a few hours ago. Can't say I could notice any performance difference. But, I've not compiled anything from source. Will be updating my Peppermint 7 system as soon as I have time! Don't panic, the 4.4 HWE (where our 4.10 kernel comes from) will get the patches too. Greg Kroah-Hartman's musings (over here) convinced me. Right now, Linus’s kernel tree contains all of the fixes we currently know about to handle the Meltdown vulnerability for the x86 architecture. Go enable the CONFIG_PAGE_TABLE_ISOLATION kernel build option, and rebuild and reboot and all should be fine. However, Linus’s tree is currently at 4.15-rc6 + some outstanding patches. 4.15-rc7 should be out tomorrow, with those outstanding patches to resolve some issues, but most people do not run a -rc kernel in a “normal” environment. If you rely on any other kernel tree other than 4.4, 4.9, or 4.14 right now, and you do not have a distribution supporting you, you are out of luck. 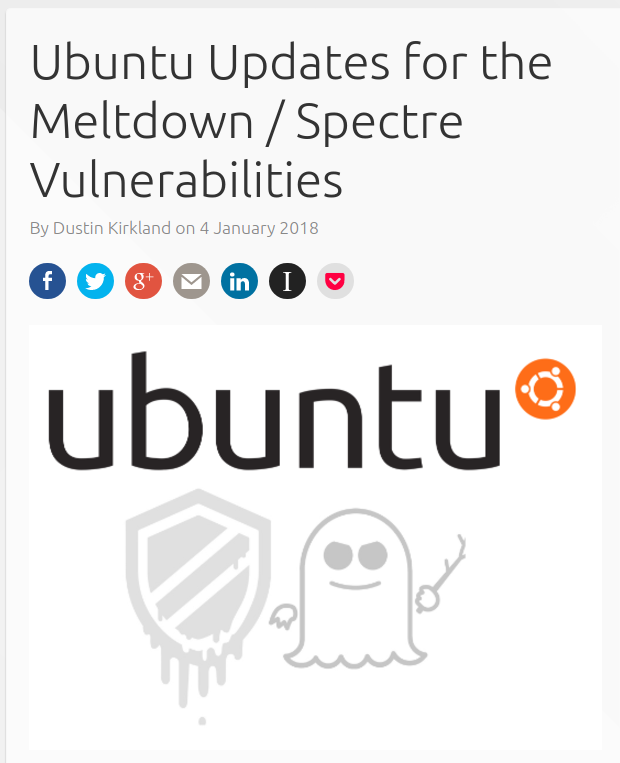 The lack of patches to resolve the Meltdown problem is so minor compared to the hundreds of other known exploits and bugs that your kernel version currently contains. You need to worry about that more than anything else at this moment, and get your systems up to date first. Also, go yell at the people who forced you to run an obsoleted and insecure kernel version, they are the ones that need to learn that doing so is a totally reckless act. Again, update your kernels, don’t delay, and don’t stop. The updates to resolve these problems will be continuing to come for a long period of time. Also, there are still lots of other bugs and security issues being resolved in the stable and LTS kernel releases that are totally independent of these types of issues, so keeping up to date is always a good idea. I too have the Linux 4.14.12 kernel on my Peppermint 6 and Seven machines and can also say that it is running just perfectly for me. I guess I'll go on and put it on my Peppermint 8-Respins too. I'm not sure what kernal I'm using. I'm running Peppermint 7. I will say that I have had my update manager preferences set so that it only gives me levels 1 and 2 updates, and I unchecked the box that said "always show security updates" because (as I remember) I was getting level 4 and 5 "security updates" which made no sense to me. Please let me know if there's something else I should be aware of, here, and doing differently. I don't recall seeing any updates popping up there in the last, say, 48hrs... thanks! Peppermint 7 should be on 4.4.0-X, unless you've manually installed another kernel. I know my Peppermint 7 is on 4.4.0-104.
every two days or so. Ubuntu is releasing the patches today, I think!? tomorrow. By the way, don't worry about the slowdown. As mentioned above, I've been using the patched kernel on my Void system for a few days now, and haven’t noticed any issues. Actually, the kernels in Void have been rolled out almost on a daily basis for the last 3 days, so far no issues. Currently on 4.14.12-3. But, I haven’t compiled anything from source yet, so it might be that I'm missjudging the slowdown?! Ok, thanks much. I think for know I'll just do the manual install in the terminal window that you suggested. I might start a new topic regarding the update manager, because I never really understood it. Personally I'd advise you stick with the default kernel and just await the patched kernel updates. I'd also advise you re-enable level 3,4,and 5 updates .. there is going to be WAY more to this than a single kernel update. Even more importantly, re-enable "always show security updates" as disabling it will stop ALL security updates. The level 4 and 5 thing is some weird thing that Mint does. We only use their update manager, not their settings. Those updates are NOT dangerous and every security update should always be installed. Period. Security updates are call that because they are updates to the security of your system. Without those updates, your system's security could be compromised. Even Mint don't disable updates from the security repo .. erm do they ?, surely not that would be absurd. I don't think so, that wouldn't be a good move, though it's been too long since I ran Mint to be sure. Ok. I guess that answers my questions, really. I sort of had the sneaking suspicion that this was what I should be doing, allowing all updates, but I wanted to hear it straight from folks more knowledgeable than myself, before I started enabling things with exotic labels like "unsafe" and "dangerous." I enabled 3, 4, and 5 and re-enabled all security updates. My system is up to date.